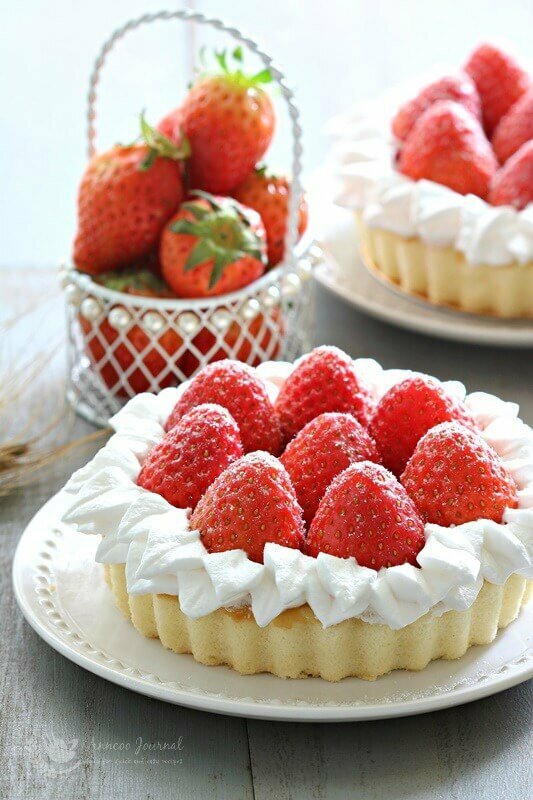 These strawberry cake tarts are not only pretty and sweet looking but yummy with a hint of cherry liqueur. 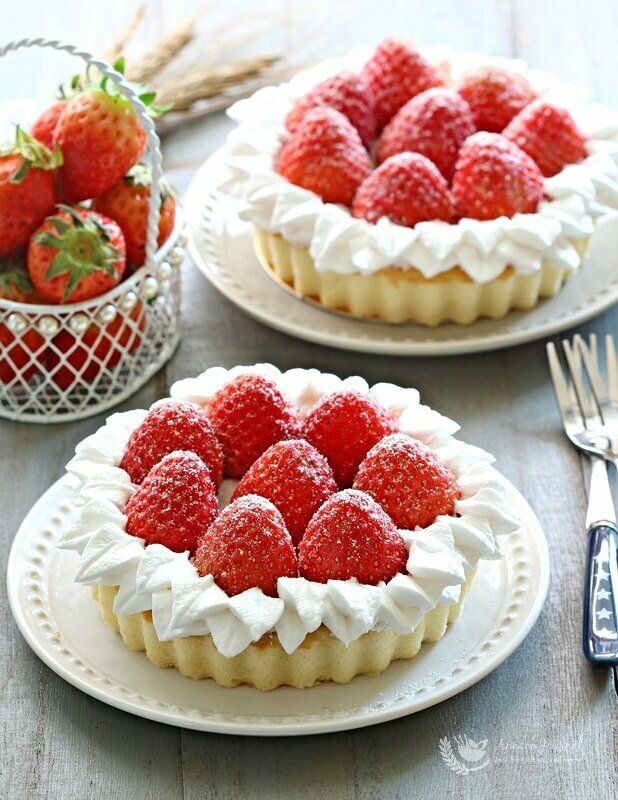 If you’re a lazy person like me, this is the best strawberry cake tart dessert that you can whip up at home, without much effort. I’m sure that anyone who has tried this dessert will love it to bits, as an after meal treat or any time of the day. The soft and light cake base only takes about 13 minutes of baking time. Once cooled, you can simply decorate the cake with fresh strawberries on top with a little cream frosting. In a bowl, mix egg yolks, vanilla extract and sugar together with a hand whisk till combined, then add milk and oil, stir well. Sift in cake fllour and mix well. Meringue - whisk egg whites till frothy with a hand held electric mixer, gradually add in the sugar in batches. Continue beating till egg whites are stiff but not dry. Add ⅓ of the egg whites into the egg mixture, fold well with a rubber spatula. Then gently fold in the rest of egg whites till combined. 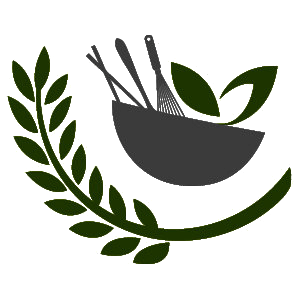 Pour the batter into 3 pieces - 12cm (5 inches) removable pie tray （no need to grease the tray), flatten batter with a spatula and bake in preheated oven 180 deg C for about 13-15 minutes. After baking, immediately drop pie tray on table top 2 to 3 times to release the hot air and prevent shrinkage. Leave cakes to cool down completely before topping with strawberries. 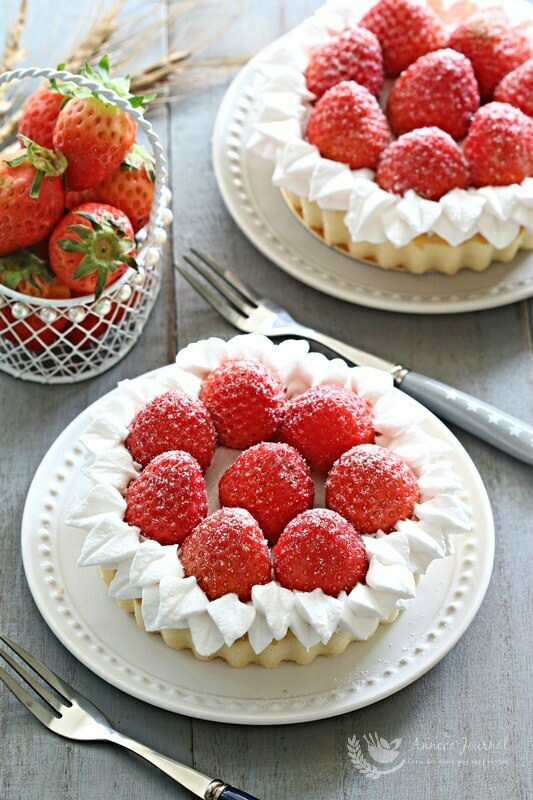 Gently remove cake from pie tray and spread some fresh whipped cream on cake and top with strawberries. Use piping bag fitted with nozzle Wilton tip #366 to pipe the small leaves around the edges of the cake. Leave cake to chill for an hour. Dust with some snow powder (or icing sugar) on top of the strawberries before serving.